If you want to stay at an Austin Convention Center Hotel, this is the spot. 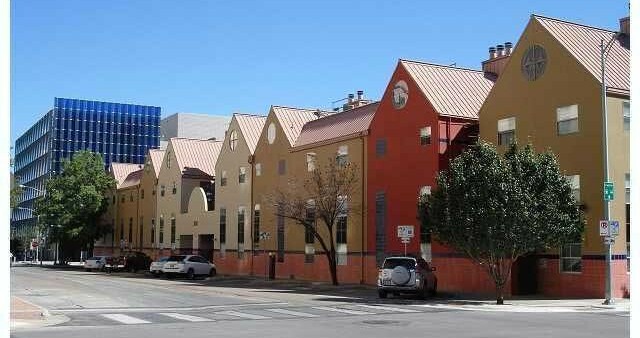 The Railyard Condos, where we currently have a number of spaces operating as vacation rentals, are literally next door to the Austin Convention Center. With roughly fifty beds available in these nightly rental properties, there is plenty of space to host Austin Convention Center Hotel groups of all sizes. Let us know how you would like your accommodations configured, and we will do our best to assist. Our guests will not only enjoy the closest proximity to the ACC in downtown, but also the luxury boutique hotel accommodations that we have created in this location. Walk to everything that downtown Austin has to offer, and come home to a swanky place with a host of hotel amenities and a whole lot more. Stay in comfort in our condominiums featuring gated and secured access, full kitchens with cookware, glassware, and silverware, Keurig coffee makers, plush furnishings and decor, free private parking, flat screen televisions, free cable television, free wifi access, luxury bedding, washers, dryers, toiletries, irons, ironing boards, hair dryers, and a community pool. If there is something we don’t have that you need or want, just let us know. We will make arrangements prior to your arrival to make your visit as seamless and successful as possible. Check out the Railyard Oasis, Grand Austin Hotel, and Cosmopolitan, to name a few. We also provide concierge services for groups requiring assistance with transportation, event planning, restaurant reservations, sightseeing tours, floral deliveries, spa services, dry cleaning, on-site chef services, house keeping, and other services. If you have questions or need help, please give us a call and we will do our best to assist with the details. Staying downtown at an Austin Convention Center Hotel has its advantages. In this prime location, we have a number of delivery services like Instacart, which delivers grocery items and supplies from stores like Target. We also have Favor. They will gather the orders from your favorite restaurants around town, and will bring it to your doorstep for a nominal fee. Try both and get a discount on your first order using the links provided. For more information, please call (800) 573-7631 or email us at wish@onyxhotels.com.